Scarlet pimpernel, commonly known as blue-scarlet pimpernel, red pimpernel, red chickweed, poorman's barometer, poor man's weather-glass, shepherd's weather glass or shepherd's clock, is a low-growing annual plant. The native range of the species is Europe and Western Asia and North Africa. The species has been distributed widely by humans, either deliberately as an ornamental flower or accidentally. A. arvensis is now naturalised almost worldwide, with a range that encompasses the Americas, Central and East Asia, the Indian Subcontinent, Malesia, the Pacific Islands, Australasia and Southern Africa. Traditionally included in the family Primulaceae, the genus Anagallis was placed in the family Myrsinaceae until that family in turn was included in Primulaceae in the APG III system. This common European plant is generally considered a weed and is an indicator of light soils, though it grows opportunistically in clayey soils as well. The origin of the name pimpernel comes from pympernele [1400–50]; late Middle English, derived from Middle French pimprenelle, Old French piprenelle; Vulgar Latin *piperīnella= Latin piper pepper + -īn- -ine + -ella diminutive suffix. When found as a summer annual, the Scarlet Pimpernel has a low-growing creeping habit, but as a winter annual, it forms a half-rosette with an upright stem. It has weak sprawling stems with square cross-section growing to about 5–30 centimetres (2–12 in) long. They bear bright green, soft, ovate sessile leaves in opposite pairs. The orange, red or blue, radially symmetric flowers, about 10–15 millimetres (0.4–0.6 in) in diameter, are produced singly in the leaf axils from spring to autumn. The petal margins are somewhat crenate and have small glandular hairs. The stamens have lollipop hairs and therefore attract a variety of pollinators, especially flies, but the flowers are also capable of autopollination. The dehiscent capsule fruits ripen from August to October in the northern hemisphere. The weight of the fruiting body bends the stem, and the seeds are transported by the wind or rain. Blue-flowered plants (A. arvensis Forma azurea) are common in some areas, such as the Mediterranean region, and should not be confused with the related Blue pimpernel, Anagallis foemina, sometimes ssp. foemina. In 2007, a molecular phylogenetic study showed that Anagallis foemina is more closely related to Anagallis monelli than to Anagallis arvensis, and should be treated as a separate species. The taxonomy has however not yet been resolved and various authorities propose either the subspecies Anagallis arvensis subsp. foemina (Mill.) Schinz & Thell, or the species Lysimachia foemina (Mill.) U.Manns & Anderb. The plant has a diploid chromosome count of 2n=40. Scarlet pimpernel flowers open only when the sun shines, and even close in overcast conditions. This habit leads to names such as "shepherd's weather glass". It has recently started to occur along the verges of salted roads, creating a broad red band along the roadside. The Scarlet Pimpernel has a wide variety of flower colours. The petals of the type arvensis are bright red to minium-coloured; carnea is deep peach, lilacina is lilac; pallida is white; and azurea is blue. The blue form can be difficult to distinguish from A. foemina, but the petal margins are diagnostic: whereas foemina has clearly irregular petal margins with only 5 to 15 glandular hairs, A. arvensis f. azurea has 50 to 70 hairs on only slightly irregular margins. A. arvensis f. azurea together with a colour variant closer to f. carnea. A. arvensis f. azurea. The glandular hairs on the petal margins, at least 50 in this example, are clearly visible in the enlarged photo. Anagallis arvensis is generally unwelcome as a cosmopolitan invasive species; it is harmfully toxic in several respects and accordingly undesirable in pastures. Perhaps fortunately, the plant is acrid and bitter, and grazing livestock generally avoid eating it except in conditions of overgrazing or grazing of unsatisfying stubble. Experimental feeding of the plant material to various animals, such as horses and dogs, caused gastroenteritis. Sufficiently high doses proved fatal. Less specifically the herb has been reported as being toxic to poultry and rabbits, and the seed to birds. Understandably, Anagallis arvensis is less often used in folk medicine worldwide than where it has long been familiar in its countries of origin. In various countries however, the plant material has been applied externally to slow-healing ulcers and wounds. It also has been applied as an expectorant and as a remedy for pruritus, rheumatism, haemorrhoids, rabies, leprosy, and snake-bite. Anagallis has been used in treatment of non-specified types of phthisis, and of kidney-related conditions such as dropsy and chronic nephritis. It was used as an antidepressant in ancient Greece, and to treat various mental disorders in European folk medicine, leading to the German name Gauchheil (Gauch meaning "fool" or "cuckoo", and heil meaning "heal"). Generally however, documented evidence for clinical efficacy is lacking. Anagallis arvensis also is known in homeopathy as Anagallis Arvensis Herba, and used against various rashes and nervous complaints. Anagallis arvensis is insecticidal, or at least is repellent to some insects, possibly by virtue of its pungent essential oil which has a characteristic smell. Taken by mouth, experimental doses of the liquid in humans caused twenty-four hours of intense nausea, headache and bodily pain. Some people also experience dermatitis from contact with the leaf. Reports from Australia state that when grain crops have been infested by the weed, chaff that contains much of the material becomes unpalatable to stock as fodder. When grazing in pasture, livestock usually leave the plant alone, but when they do nonetheless eat significant quantities, they suffer diuretic and narcotic effects sufficiently intense to justify regarding the plant as poisonous. Reportedly an Indian practice of expelling leeches from dog nostrils can lead to fatal results if the animal swallows the fluid. The herb and its seed contain saponins, which could explain why fresh material is strongly haemolytic. Among other possible glycosides, the root yields the triterpenoid glycoside cyclamin which is highly toxic and occurs in Cyclamen species, also a member of the subfamily Myrsinoideae, and arguably also in the Primulaceae. The plant contains tanning agents, bitters, and the proteolytic enzyme primverase. Antibacterial tests of the green parts failed to show any encouraging positive effect. Scarlet pimpernel (anicham in Tamil) is one of the two flowers mentioned in the Tirukkural. The Scarlet Pimpernel is the alias of Sir Percy Blakeney in the novel of the same name by Baroness Emma Orczy. ^ English Names for Korean Native Plants (PDF). Pocheon: Korea National Arboretum. 2015. p. 351. ISBN 978-89-97450-98-5. Archived from the original (PDF) on 25 May 2017. Retrieved 25 January 2016 – via Korea Forest Service. ^ a b "Scarlet Pimpernel (Anagallis arvensis)". Connecticut Botanical Society. ^ "Factsheet - Anagallis arvensis". ^ "Angallis arvensis (Scarlet pimpernel)". ^ "Descriptions and articles about the Scarlet Pimpernel (Anagallis arvensis) - Encyclopedia of Life". Encyclopedia of Life. ^ "Anagallis arvensis in Flora of North America @ efloras.org". ^ Manns, Ulrika; Anderberg, Arne A. (2007). "Relationships of Anagallis foemina and Anagallis arvensis (Myrsinaceae): New insights inferred from DNA sequence data". Molecular Phylogenetics and Evolution. 45 (3): 971–980. doi:10.1016/j.ympev.2007.07.022. PMID 17869544. ^ Oberdorfer, Erich; Schwabe, Angelika (2001). Pflanzensoziologische Exkursionsflora : für Deutschand und angrenzende Gebiete (8 ed.). Stuttgart: E. Ulmer. ISBN 3800131315. ^ Dörr, Erhard; Lippert, Wolfgang (2004). Flora des Allgäus und seiner Umgebung. Eching: IHW-Verl. ISBN 3930167611. ^ a b c Harold C. Long (1917). Plants Poisonous to Live Stock. CUP Archive. pp. 49–. GGKEY:ZF2C4UTG0H9. ^ van Wyk, Ben-Erik; van Heerden, Fanie; van Oudtshoorn, Bosch (2002). Poisonous Plants of South Africa. Pretoria: Briza. ISBN 978-1875093304. ^ SHARMA (2011). PLANT TAXONOMY 2E. Tata McGraw-Hill Education. pp. 371–. ISBN 978-1-259-08137-8. Harvey Wickes Felter and John Uri Lloyd (1898) King's American Dispensatory. Ulrika Manns; Arne A. Anderberg (2005). "Molecular Phylogeny of Anagallis (Myrsinaceae) Based on ITS, trnL-F, and ndhF Sequence Data". International Journal of Plant Sciences. 166 (6): 1019–1028. doi:10.1086/449318. 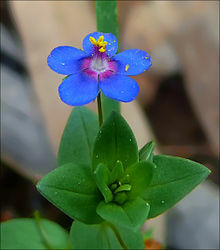 Wikimedia Commons has media related to Anagallis arvensis.